This book goes by Rockman Zero Official Complete Works (ロックマン ゼロ オフィシャルコンプリートワークス) in Japan. An English translated edition is also available from Udon under the name Megaman Zero Official Complete Works. 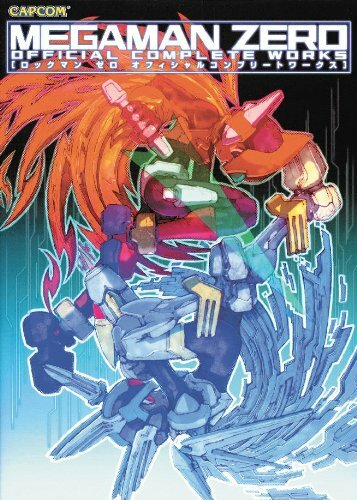 This book collects art up to the fourth series, with the story of Rockman Zero thrown in. There are five chapters, namely Introduction, Character, Enemy, Cyber Elf and the Special Contents. The character art shown are mainly the ones in the games with a few design sketches thrown in. They have really nice details compared to the low resolution versions in the gameplay itself. Characters include Zero, Ciel, Resistance, Neige, Caravan, Craft, Cyber-X, Harpuia, Fefnir, Leviathan, Phantom, Copy-X, Elpis, Dark Elf, Omega and Vile. Under the enemy section, we have the bosses as well as the normal enemies in all four series. Compared to bosses in other games, Rockman bosses certainly are more colourful, although not less menacing. The last section contains more rough sketches and illustrations, logos, data sheets, screenshots and an interview with the creators (in Japanese). This is primarily a character design book geared towards mechanical designs. It's a nice resource book for anyone into robot designing. You can read more about Rockman Zero on Wikipedia. This one Japanese is a hardcover? It's a paperback, just like the English edition.